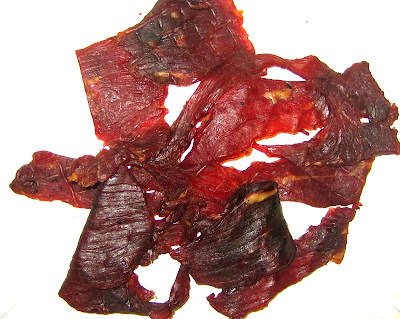 Golden Valley Natural is a brand of beef jerky made by the company of the same name, based out of Idaho Falls, ID. 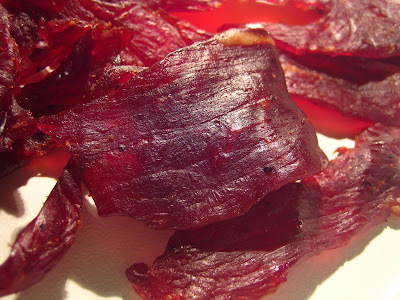 Having launched in 1999, the company focuses on making organic jerky, using all organic ingredients. It was started by Roger Ball, a well known name in the jerky business, having started King B Snacks in 1968, a brand that invented the "shredded jerky" concept, and was among the first to introduce a whole-muscle type of jerky. King B has since found its way into truck stops and convenience stores all across the USA. In 2003, Jack Link's bought King B. In 2004, Roger Ball created "Jerky Direct" a brand of jerky that sells exclusively through direct sales, otherwise known as multi-level marketing. Jerky Direct gets its jerky from Golden Valley Natural, and I believe is exactly the same jerky. Organic beef, organic evaporated cane juice, water, organic soy sauce, organic apple cider vinegar, sea salt, organic paprika, natural smoke flavoring, organic black pepper, organic onion powder, organic garlic powder. A very slight sweetness is probably the first thing I notice when putting a piece into my mouth. I can also detect a bit of smokiness. After that a subtle taste of the natural meat flavors. Probably the word that stands out the most to me with this jerky is "bland". It just doesn't offer much taste at all. Being that this is made from organic beef, one would assume that the natural meat flavors is something to emphasize. But, there is very little taste of it. I do sense a tad bit of black pepper, but there is very little black pepper to be seen on these pieces. It's not even salty, which is a good thing for me, since I don't like overly salty jerky. But having some more salt would give this a flavor. Even though soy sauce has a high weight in the ingredients list, I don't really taste much of that either. Overall, this jerky doesn't taste bad, but then it doesn't have much taste period. These appear to be real cuts of meat, sliced average thickness, and in medium sized pieces. This is a semi-moist variety. It's very easy to tear off a piece, and very easy to chew. After chewing, it's almost a tad mushy. Since the majority of people who emphasize an organic diet are women, it probably makes sense to give this jerky a soft and tender texture. I don't find any tendon or gristle on these pieces, however there is some small bits of fat to be seen here. Overall, the meat consistency is excellent, allowing me to enjoy this jerky's absence of flavor without detraction. I paid $6.69 for this 3oz package at a Henry's Market in Temecula, CA, which works out to a price of $2.23 per ounce, making this an expensive buy. I'd say that this offers a weak value for general beef jerky consumption. An excellent meat consistency is about all you're getting from this. Otherwise, there's very little flavor in this. As an organic jerky, it may provide more value for your dollar. However, I've found other organic jerkies priced less. This particular brand is only giving you a great meat consistency, however, and nothing else. While I think this jerky does have some snackability with its excellent meat consistency, it doesn't really offer any taste satisfaction. No real flavoring that stands out, and no natural meat flavors. I find that to take away from the snackability. That's too bad because this being an organic jerky, tasting the goodness of organic beef should be this product's unique selling point. And being priced high, consumers ought to get something tasty for their dollar. I appreciate this company making organic beef jerky, but I have to have something to taste.